We have absolutely no idea what's going on with world's reptiles these days. It seems like nowadays, snakes are insisting on being a part of the human world; slithering out of toilets, boarding planes or unexpectedly showing up anywhere. Yes, it’s that common these days. In yet another such incident, a snake tried to make unwanted contact with a human in the most unthinkable way. 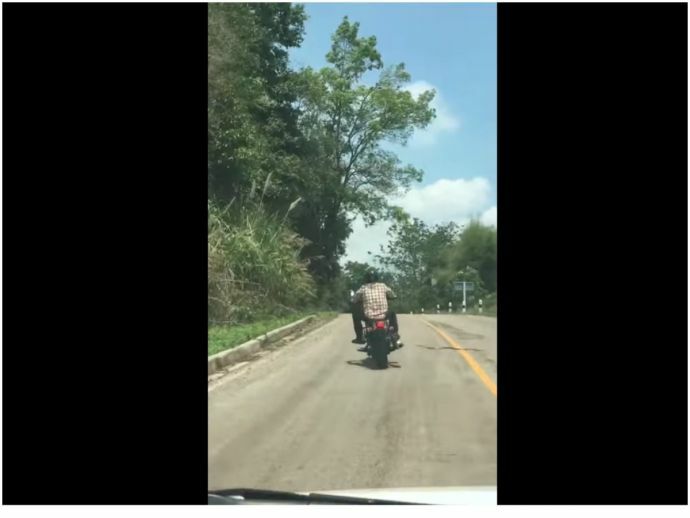 Just as a biker was driving down a street in Lampang, Thailand, a slithering snake coming across the road attempts to put its fangs into the bikers foot. Fortunately, the rider lifts up his feet at the right moment, saving himself from getting bitten. Animals aren't supposed to be blamed for such behaviour, no matter how vicious, sadistic, ruthless or bloodthirsty it is, because they are simply following the instincts given to them by mother nature. But, this is just beyond extraordinary.